Nike has worked alongside a team of athletes to develop a single-layer stretchy hijab that could "change the face of sport for Muslim girls". The Pro Hijab is the result of a year-long collaborative process between Nike and top female Muslim athletes, such as weightlifter Amna Al Haddad and figure skater Zahra Lari. When working on the design, Nike took on board the concerns competing athletes face when wearing a hijab, examining the ways these affected their performance. Al Haddad, who is from the United Arab Emirates, recounted how the garment's weight, its likelihood of moving around and its lack of breathability disrupted her focus. "The one obstacle that's always there if you're a hijabi is what are you going to wear on your head?" said Al Haddad. "For us, we come up with ideas and ways to be comfortable in what we wear, but to have the number one sport and fitness brand in the world facilitate this process for us is going to change everything." The Nike Pro team – which is responsible for creating athletes' base layers – took Al Haddad's feedback on board, and began looking into how they could make a performance hijab similar to other Pro products, which are typically inconspicuous and act almost as a second skin. The final, pull-on design is constructed from a single layer of Nike Pro's power mesh fabric. This polyester features tiny holes that makes it breathable, but it remains completely opaque. The Pro Hijab stretches to adapt to the wearer's head, and its cut is optimised for sport. "Ice skating, for example, requires a tighter fit for twirling," said Nike. "The back of the hijab is also elongated to ensure it doesn't come untucked. Fluff threads were used at the neck to eliminate the rubbing and irritation that can occur when an athlete sweats." While the hijabs were developed with athletes in mind, Al Haddad and Nike hope that it can encourage Muslim women and girls worldwide to take part in sports and physical activity. "It's revolutionary and will change the face of sport for Muslim Arab girls," said Al Haddad. "You have no idea how important this is. It's going to inspire girls worldwide to follow their passion for sports." 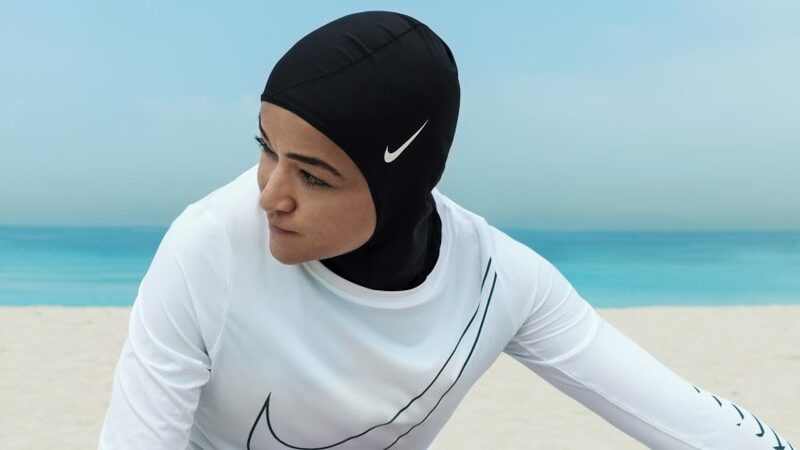 While its not the first hijab designed for sport – Elham Seyed Javad of Canadian company ResportOn similarly designed one in 2011 – it is the first consumer hijab from Nike. The Nike Pro Hijab was unveiled on the same day as the sports giant presented its "fastest shoe ever", which is designed to break the two-hour marathon barrier.